Manager: "Here comes Cherie, you know she practices that Ikea... hows that coming along?" Me: "Oh not too bad, my sofa waza is really improving. And you should really see my coffee table technique." Co worker1 :" have you moved up to Futons yet?" Me: "oh not I'm not nearly ready to test for Futon but I'm seriously considering getting an akita. And I am really working on finding my key. I lost it the other day, in among the pillows I think." Overly macho male co worker: "Show me some of that Ikea"
Me/shrugs ,"ok", walks over and hold out hand: Co worker takes it acting a bit worried. I make a good strong connection, shake his hand say," nice to meet you", and a very confused and slightly deflated ego slowly walks away.. I like practicing Ikea. how about you? Does you style also include weapon training with the hex key? We recently had a guest sen-sales-rep visit our store to teach us some of her ways. Man her Show-room-menuchi is amazing! You killed me. You just killed me ded with this. Ah, but does she know the ancient Scandinavian rules of "circle, triangle, square" for organizing Kassett storage boxes in small spaces? hmmm good question.. I'll have to ask at our next meeting. I'll be careful not to offend him lest I be chosen to take ukemi and become very thoroughly blendered with the door mat.. It is now becoming a well-known fact, via forums such as this one, that modern Ikea is only a mere shadow of what the founder intended. It is missing something that has been Hidden In Plain Sight all along - the powerful internal energy that drives all technique, without which Ikea becomes a meaningless shell, a mere shadow of its true potential. 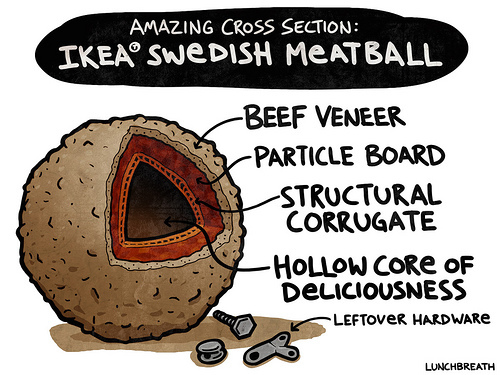 In short, no meatballs = no Ikea. Sure, most people are satisfied eating a cheap hotdog and chips on the way out. Especially after getting lost in the veritable jungle of possibilities that comprises modern Ikea. But we have to ask ourselves - did the Founder live off of hotdogs, or meatballs? I understand what you're saying, Josh, but remember that Ikea can be different things to different people. Some are satisfied if they get a hot dog and a cinnamon bun with their EKTORP sofa and armchairs set, and have no interest in meatballs. On the other hand, I have to say that the meatballs of today are not the Meatballs of Yore. They have been cheapened and watered down by overly wide application to places that may not have been ready to appreciate their complex and deep flavors. Too often nowadays we find young Ikea practicioners who think they know all about The Scandinavian Way because they had $6.99 meatball plate once on their way out the store. And, harsh as it may sound, I think American Ikea has lost its True Kött-Budo Spirit. At least in European Ikeas they still put dried onions on the hot dogs. I was wondering what you thought about mixing Ikea with other things? I mean, I have a set of BIlly Bookshelves, and I also have another set that seems like they would work good together with the Billy Bookshelves. Do you think that this is Okay, or will it hurt me in the long run? Oh my! Thank you for the perfect topper to a great night of training. I found it particularly difficult to make the sudden changes of direction required in the Kot-racke-gaeshi version. I kept finding myself back outside the building rather than managing to actually get inside. Perhaps I needed more meatballs or maybe a bigger key? You know the crazy thing is I have yet to step into an actual Ikea store... and today ,of all days, I get one of their catalogs in the mail. Last edited by Shadowfax : 08-06-2009 at 08:49 PM. "Is IT Missing In Everybody's Ikea ?" Do we need outsiders like Walmart to help put IT back into Ikea? They have Subway's meatball subs. Last edited by dps : 08-06-2009 at 08:54 PM. While Subways meatball subs are certainly enjoyable and have their advantages they really fail to promote the sense harmony with the digestive tract that Ikea's unique flavors provide. While certainly a $5 footlong is a quick means to end the hunger conflict it has far more potential to cause damage to the eater. Ikea produces a far more lasting and satisfying result. Not to mention it can create harmony in your living space as well as helping you find your own inner style. The deep problem with modern Ikea is that it is made from particle board with only a picture of the real thing on the outside. If you try to do modern Ikea with waterfall misogi, for example, it will swell, warp, and fall apart. And worse, there is no real connection between the parts, just cheap screws. Our shoe rack by the dojo door is falling apart because of this problem. If our shoe rack is not strong, how can our Ikea be strong? Well I am not sure about "IT", but I think MMA is in Ikea. I was doing some Ikea a few weeks ago and, yes....they do have Mixed Mobile Accessories in their various dojo spaces. Are you saying modern Ikea has no internal strength? LOL that is too funny David. But where is the Key? Does it really exist? I just wanted to step in to encourage people to please try to steer this discussion back to Ikea. If you feel the need to move this subject to a broader context outside of Ikea, please take it to the Open Discussions forum. Key cannot be seen... only felt. Which is why I am having such a hard time finding mine amongst all the sofa cushions.It does not help at all that I am continually tripping over the footstools while attempting to assemble the various parts that came packed in those silly flat boxes. Fortunately the Skydda mattress is deep so I'm not getting hurt when I land. Our shoe rack by the dojo door is falling apart because of this problem. If our shoe rack is not strong, how can our Ikea be strong? Really it all comes back to the hex key. If we learn to use its power our shoe rack can become strong. David you have gone above and beyond! Awesome illustration you have helped me to understand the meatball waza immensely now I can see how all of the parts form a whole. ROTFLMAO!!!! Jun, this is the funniest thing you've posted since "nobody expects a ki war." THANK YOU!!!!! But Ikea IS strong. Once you use the Key and you get all the parts connected and wired together correctly. There are ways to test this strength too. Sitting on the Chair for instance is a good test. You must sit the right way though. if you lean back, are off balance, or attempt to move it putting too much weight on any one leg, well then it is not so strong and it will break. Once it breaks, you cannot fix it again. The does a clear job showing that unified it is strong. However, once the structure becomes weak...no about of "glue" will keep it strong enough to be useable. Jun you had me going I was trying to figure out where we got off topic! Meant to come back to this sooner. One of my fellow Ikeadokka is also practicing Feng Shui and it seems that occasionally she does get a little mixed up between the two kinds of movements. But she does say she enjoys both and believes the two can compliment one another in time. Personally I think it would be best to get a solid foundation in your Ikea before accessorizing with the Billy bookshelves so as to keep you from being as confused. I was telling my co worker today, about last nights revolving door waza and he offered the opinion that Home Depot was superior. After a careful check of the weather... its not raining .... I told him we should certainly test that theory out. He declined the invitation though.